Electro WOW ► Electronic Music News: The All-In-One DJ Controllers Grow In Popularity! As a DJ, you may have heard something like this leveled at you and your ilk at least once: “All you’re doing is pressing buttons!” As enlightened sympathizers, we know like you do that playing piano or drums really just boils down to pressing buttons, as well. So for better or for worse, and whether you’re an experienced DJ or not, with a good “all-in-one” DJ controller, you can pull off professional DJ sets by doing nothing more than—you guessed it—pressing buttons! Of course, there’s much more than just that to great DJing. More elaborate equipment can certainly help, but even a basic controller can get you started mastering the fundamentals, which is still your most direct avenue toward successful DJing. When we talk about an all-in-one DJ controller, we’re referring to a USB MIDI controller for DJ use that includes an audio interface and has enough controls to suffice as the only controller you’d need to perform; in most cases, that entails a controller that condenses the layout of two turntables and a DJ mixer into one box, and modern units generally include extras for effects, looping, sample and/or cue point triggering, transport, browsing and loading tracks, and more. Of course, depending on your ambition, you could always add supplemental controllers to the setup. Of concern when choosing a controller are, of course, price and then built-in software, and whether the unit has two or four mixer channels. Most DJ software these days supports 4-deck mixing, meaning you could have four tracks playing and being mixed at once! The prices vary according to your needs as a DJ. There are three prices ranges for DJ Controllers: less than $500, $500-$999, and $1,000 and up. Some of them come with some form of software—either a limited version or the full professional program. 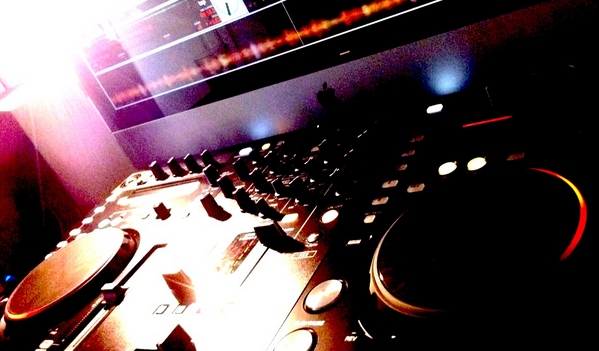 Remember, the best way to get DJ gigs is to produce your own music—something you already do! And a great way to get your music some exposure is to play it out; successful DJing and music production naturally feed off of each other. My favorite all-in-one DJ Controller is the Pioneer DDJ T1.